These beautiful female bunnies were brought in after a population explosion in their home. 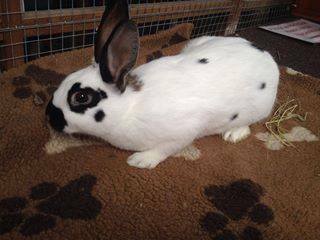 They will be neutered and vaccinated before leaving, we will be looking to rehome Jade and Lulu (spotty ones) together, Perri and Jessy could go to a home with a neutered (preferable male) rabbit. 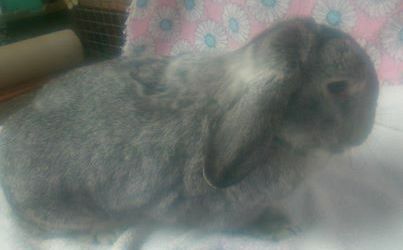 Leo is a beautiful 18 month old male grey lop rabbit, who is chincilla colour; Leo will be neutered and vaccinated before leaving. 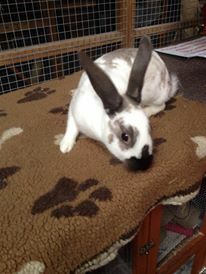 Leo has had several homes in the past and is now looking for his forever one; preferably one with a neutered lady friend. We have many other cats/kittens/dogs for adoption, but are on our waiting list to come into the centre and not currently here yet, but we would be more than happy to pass on the details if you are interested. Following a recent article in our local paper Teesdale Mercury our tortoise has successfully been rehomed in a new home with other tortoises. When an animal comes in it is vet checked to ensure it is in good health, deflead and dewormed to avoid passing these pests onto others in the centre. Neutered if it hasnt already been done, microchipped to ensure that the animal can be traced if ever lost and either complete injections or start the whole procedure from scratch. They will leave with 4 weeks free insurance and a food starter pack to help you animal settle in quickly. Animals only leave here in completely healthy condition and only on completion of a successful house check.